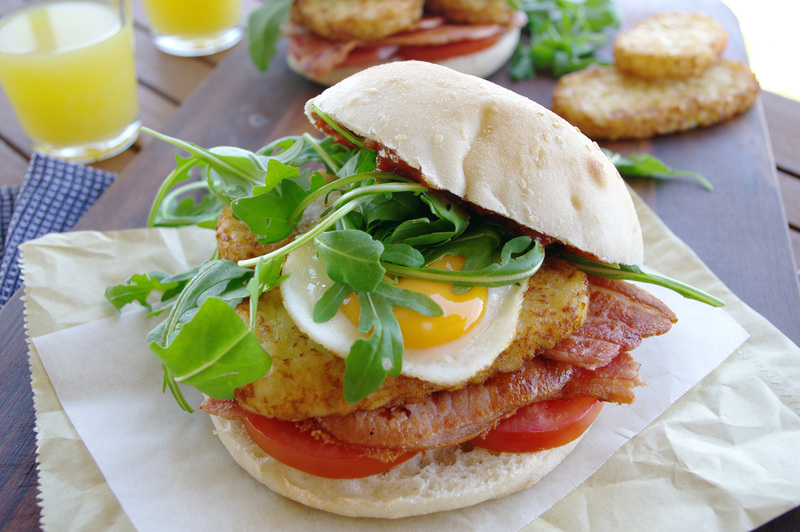 Bacon + egg + hash brown + roll = an epic breakfast that will banish even the most evil of hangovers. If there is one thing we can all agree on, it’s that after a big night nothing will make you happier than a bacon and egg roll. This number also includes the added bonus of not one, but two hash browns; along with rocket and tomato so you can feel like you’re doing something okay for you body. It’s hearty, quick and simple enough that you can make it while even if you’re minus a few brain cells from the night before. Don’t worry, I’ve got your back. Heat half the oil in a large frying pan, add bacon and cook, turning occasionally, until browned and cooked to your liking (3-4 minutes for semi-crisp). Drain on paper towels and keep warm. Wipe pan with paper towels, add remaining oil, crack in eggs and cook over medium-high heat to your liking (3-4 minutes for soft yolks). To serve, top Turkish roll with tomato, bacon, McCain Hash Brown, egg, rocket and a dollop of tomato relish. Season to taste, add roll top, and serve hot.